On a freezing cold winter's night there is nothing quite like sitting down after dinner in front of a blazing log fire. Central heating has its' place, of course, but it doesn't provide the ambience that an open fire does. Naturally, when you have a log fire you need somewhere to store the logs because you don't want to have to keep getting up and going out into the garden to the log pile on a cold night, and at Contemporary Heaven we have got you covered with our range of modern log baskets that will do the job and make your fireplace look great at the same time. Our Norse black metal log holder comes complete with a kindling holder at the top, so you have everything ready for your fire in one place. This log holder is stylish and streamlined and will hold enough logs for an evening's burning, and then some. The Blomus Madra log holder is another cleverly designed log holder that doubles as a carrying bag. It has a stainless-steel supporting structure with four small feet. The logs are held in a black fabric bag which simply clips on to the top of the support. You just take the bag to the log pile and fill it with logs and bring it back using the carrying handles, and then slot it back on to the top of the frame. Ingenious, yet simple. We also have a modern take on the traditional willow log basket. 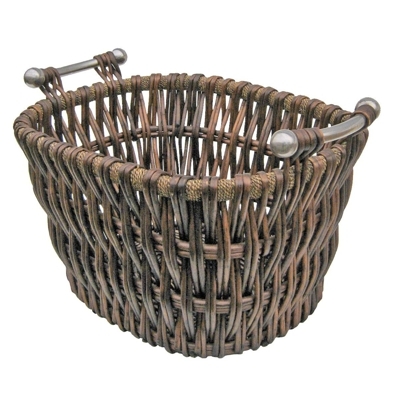 Our version is in hand-woven dark willow, so each basket is unique. They have chunky steel handles and at 55cm wide, 44cm deep, and 35cm high are big enough to hold enough logs for your fire to burn all day. There is also a modern rectangular version available that does not have the rounded curves of the other model. Then there is our Roco Verre log basket and fireside tool set. This is a sleek modern design in a beautifully finished chromed steel. This is 57cm high by 20cm wide, and 30cm deep, and the companion tool set contains a poker, fire tongs, shovel, and hearth brush, each of which hangs from a hook at the top of the frame. There is plenty of room for enough logs to keep your fire burning throughout the evening. In addition, we have a modern log holder in black metal with carrying handles for the logs, and a matching kindling holder. These sit together neatly on the modern fireplace.